This month you can become an undead detective seeking a master thief, or a young girl trying to restore colour to a black and white world. You could also travel far back into the past as Noah seeking the last animals for his Ark, or into a far future where an intelligent apartment locks its owner inside. Alternatively, why not go for a walk in the park that may not turn out as relaxing as you might expect? 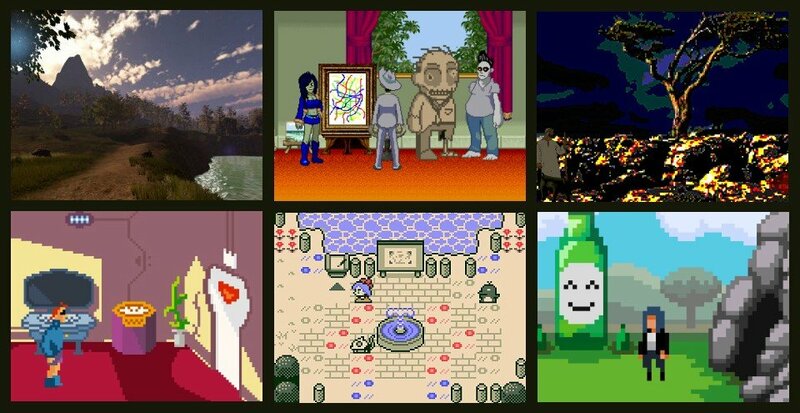 All these await in this month's round-up of releases from the freeware scene. In the second of three small Detective Margh game released before the big commercial Zombie Society adventure is completed early next year, we find the undead private investigator reading a note to his assistant Ghvnn. It's from the Nine Deaths Cat and is intended for Mr. Kashl, the art tycoon. Nine Deaths Cat is a notorious thief who has been stealing very valuable things for centuries and has never been caught. Margh is hired by Miss Slobber, a famous artist who makes paintings and statues, as for some reason it was she who got the note, not Mr. Kashl. The message says that Kashl is a bore and Nine Deaths Cat will steal the thing that he needs no more. And so, a new case is born. The artwork of Zombie Society vs Nine Deaths Cat will be very familiar to fans of the series. The game world is presented in third-person view and cartoony zombie characters walk around in a rather realistic world, drawn in a simple pixel art style but with enough detail to recognize everything. Apart from their office headquarters, Margh and Ghvnn visit a museum, an art studio, a police station and the house of someone introduced in an earlier game. The loud music that accompanies the action is the same as in the last game, and as before it's quite repetitive but can be switched off. The zombies' language is translated to English and displayed in speech balloons, so apart from the occasional zombie grunt you don't hear any voices. There are some good sound effects, though, such as the slamming of doors, the scratching of Margh's pen in his notebook, and the crash of objects falling. Gameplay is easy with the mouse-driven interface, the cursor changing to indicate interactive items and exits. A bar appears when the mouse is moved to the top of the screen, giving access to the inventory, Margh's notebook, a magnifying glass that shows all the hotspots in the current scene, and the game's menu from which you can save your progress. There is just one save slot, but the game is short and linear so that is enough. Few, if any, puzzles in this game are inventory-based. Instead you’ll have to persuade a guard to let you pass, as well as interview people, find evidence and make deductions from all the facts you gather. Of course Margh uses his handy deduction board once again: all clues are written down in his notebook, and by combining them you can draw conclusions about the questions raised during the investigation. The clues and deductions help you eventually decide what must have happened and predict what Nine Deaths Cat will do. Some clues are quite vague or cryptic this time, so it's a bit harder to find out who the criminal is and what they are after than in the previous games. In all, the game took me about 40 minutes to finish. Zombie Society vs Nine Deaths Cat can be played online at Kongregate. Noah has built his Ark and has gathered one male and one female of almost all species on the planet. He just needs to get a lion, a boar, an ape and a sheep, all male. But because there are only a few hours left before God pours down torrents of rain upon the Earth, Noah has to hurry. 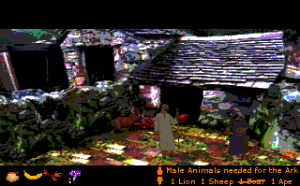 Noah's Quest, by slasher, is presented in third-person using crude pixelated paintings in which many colors are used. Dark clouds fill the sky in which the sun is very low, giving the landscape a suitably gloomy look. 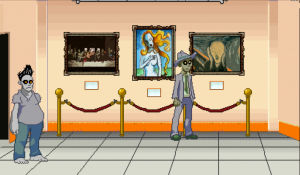 The characters are shown in a higher resolution than the backgrounds and are quite detailed. Noah has to find the animals he needs in their natural environments, so he visits a farm, the desert, a wood and a mountain to get them. There is also a market in the nearby village where he can buy things he needs for his quest. Imposing music, the particular tune depending on the location, plays in the background. There are a few sound effects, like the stamping of feet and howling of the wind, but they are not very realistic. In lieu of voice acting, all spoken text is shown in clear letters in a bar at the top of the screen. Noah is controlled with the mouse: right-clicking cycles the verbs look, grab, talk and walk, while left-clicking executes the command. The inventory is shown at the bottom of the screen, as well as a list of the animals Noah must find. Gathering the animals requires luring them from their lairs, so Noah needs to acquire things he can use to attract them. Once he has won an animal’s trust it will walk with Noah to the Ark without any problem. The puzzles are not hard but they are well made, logical and nicely integrated into the gameplay. However, it’s the interactions between Noah and the other characters that make the game worth playing. Noah is shown as a normal man in this game, who may have a strange delusion according to most of the people around them, but is still accepted as a friend or part of the village. Noah's Quest can be downloaded from the AGS website. It's almost six in the morning when the apartment building is hit by lightning. This has strange consequences, one of them being that the door to our nameless protagonist's apartment now thinks that it's alive. Worse: it won't open for him. The door believes it's pointless for the protagonist to go to work, and is not shy in telling him its reasons for thinking so. But our protagonist has to go to work, so he’ll need to convince the door that it is wrong in order to open for him. 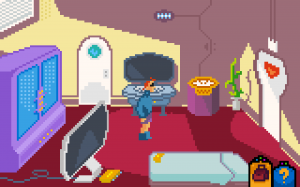 Earthling Priorities, by Konstantinos Dimopoulos, Daniele Giardini, Jim Spanos and Chris Christodoulou, is presented in third-person view in chunky pixel art. The game features only three locations: the bathroom and living room of the protagonist's apartment, and a square in front of a factory. There is no voice acting; all spoken text is displayed on the screen with a different color for each speaker. Sound effects, like the whooshing and creaking of doors opening, squeaking wheels and exploding fireworks are all reminiscent of the sounds that 8-bit computers of the 1980s made. The electronic background music is of high quality, however, and was made especially for the game. Right-clicking an object makes the protagonist share a description of it and left-clicking causes him to interact with it. Right-clicking the same object again often elicits another description, and the commentary provided can be quite funny. His observations clearly convey an eagerness to belong to the posh demographic that has the "right" things, often designed by famous people and very expensive. On the bottom right of the screen are two buttons: clicking the left one brings up the inventory, while the right one calls up the game's menu. Earthling Priorities is an odd parody on corporate culture and modern life, whose puzzles are not very hard but are logical and well-integrated. Although it is a short game (you can theoretically finish it in about 3 minutes), it took me about 20 minutes to complete when I first played it because there is quite a lot to see and the protagonist has something to say about nearly everything you click on. The ending is a bit strange but fitting for this game. Earthling Priorities can be downloaded from the game’s website.